This week life has been drifting along between hospital appointments and end of term school stuff. I am so disorganised! What is wrong with me? I can’t remember anything – even worse than usual and I’m driving my family mad with either repeating stuff or forgetting! ahhhhh! frustrating.went well again yesterday – which is great news which = happy oncologist! and happy me! Bit tricky getting a good vein but after a bit of a warm up they managed to get one on the inside of my arm! ouch! First I have a flush to make sure vein is clear, then antihistamine and then steroids (hydrocortisone) – these make me feel really tired and heavy but they are needed to help make sure I don’t have a bad reaction to the Herceptin. I also have to take paracetamol – this helps with any pain. So then another flush and a break for half an hour, then the Herceptin. It feels really cold and I can feel it going up my arm and into the top of my body, then I can’t. But my whole body shivers. 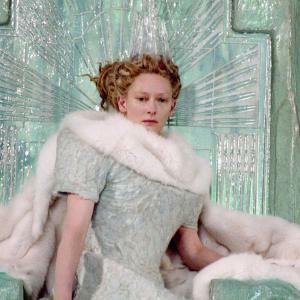 I feel a bit like the ice queen from Narnia! Next time we need to remember to take more blankets and socks in for me! I really am like a little old lady! So all of that took about 5 hours! They take my blood pressure, temperature and oxygen levels throughout and constantly ask how you feel. It’s really boring – especially for Phil but we’d better get used to this as I’ll be there every 3rd week for the next year! Had an awful night’s sleep – ached all over even with some more paracetamol. Finally got to sleep at about 5am! So I am even more exhausted now! Today was Freya’s sports day. Luckily it rained yesterday and was postponed. This was good as I managed to pop down this morning to watch for a bit. I don’t actually know how I forced my legs and body to move but I did. It’s quite funny as everyone said how well I looked today – I actually felt quite awful – so at least I don’t look how I feel! 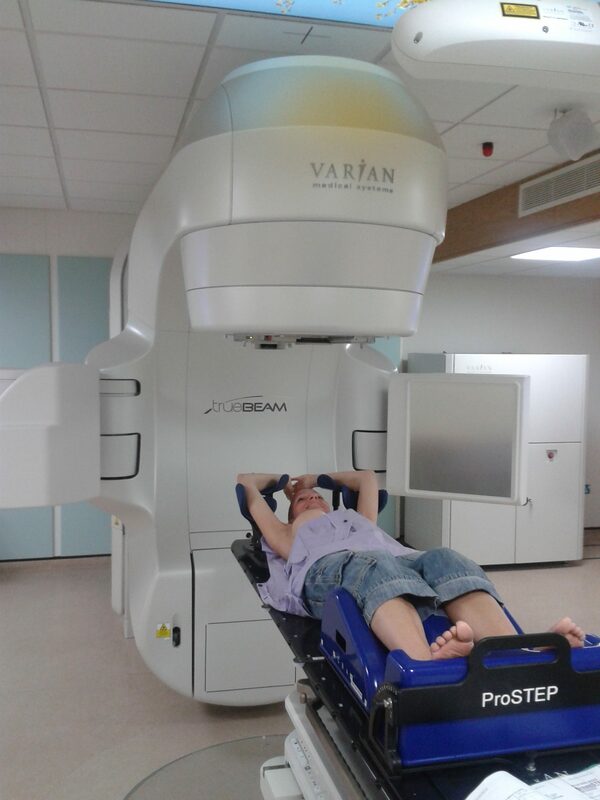 Then I had to whiz back to get to the hospital for my first radiotherapy treatment. I wasn’t nervous at all, quite excited really as I love all the high tech equipment! I think I’d like to be a radiologist! 3 year degree course – am I too old??? Anyway, we met with a lovely Russian radiologist who had to run through more questions and I had to sign more consent forms. We of course questioned her about Russia! If you live in Russia you get given a free house, free land, pension, there are loads of jobs that pay well – sounds good! I suppose they send people to space! Never think much about Russia. So then I was taken into a small changing room where I had to remove my top half clothes and put on a special gown. 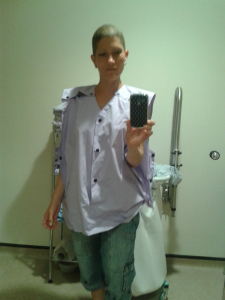 These gowns have poppers everywhere so they can be easily undone for radiation. I get into position – helped by 2 friendly radiologists – they all seem so happy! They use the 3 dot tattoos made last week to line me up. Then I have to stay very still – just taking normal breaths. This is totally fine. The radiologists call out co-ordinates each time to get the machine lined up and draw pen marks on my chest ready for zapping me. Each time they go out of the room – about 3 times. It has to be really precise and the lazers are set at an angle so they don’t go through my body and cause any damage to my lungs or internal organs. It’s all very clever and mathematical. I just lay there as this takes about half an hour. I actually feel like I’ve been abducted by aliens and they are zapping me with their supersonic lazers! Very high tech! Afterwards my skin feels a little tingly and sensitive already – this is probably still from the nerves after surgery too. They have said that each time this may get worse but they will be keeping an eye on me. I also get another reminder to stay out of the sun completely while having treatment! I feel more and more like a vampire every day! So til tomorrow – early start with Physio at 8am, Radiotherapy at 8.30am all at Colchester General, then whiz over to Colchester County Hospital to see the lovely Dr Chakravorty for a post op check – I am sure he will be pleased. Busy busy. Thank goodness the children break up for the summer holidays soon. Tracey, which side of your body is being zapped? And why not do the training? Perhaps you too could end up in space!